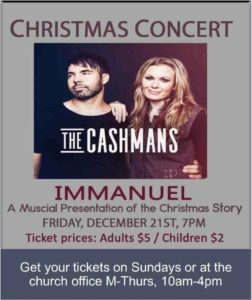 JOIN US on Friday, December 21st at 7pm for the 2018 Cashman’s Christmas Concert! Advance tickets are $5 for adults, and $2 for children. Prices double at the door on the day of the concert. Use the form below to purchase your tickets online, and someone from the church office will contact you to arrange ticket pick-up or will call. If you would like to purchase more than 15 adult or children’s tickets, you can complete the form multiple times or contact the church office at 772.337.9766.